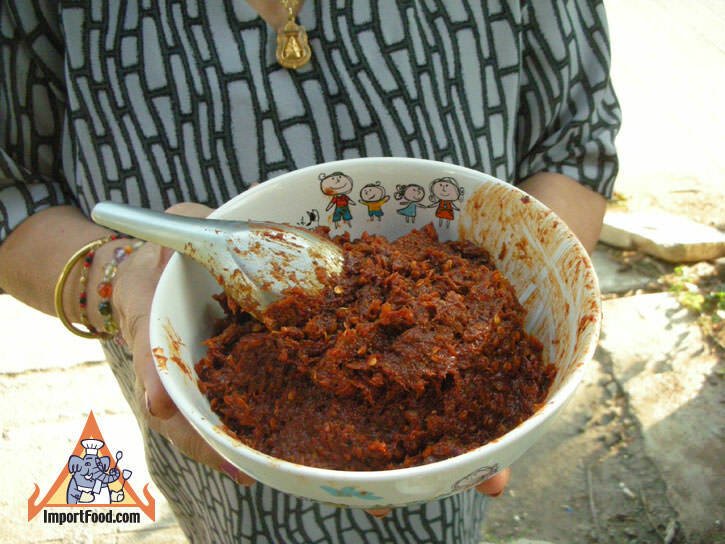 Prik Pao is a pounded chile paste that's bursting with flavor, a key ingredient in tom yum, and all-purpose staple in every Thai kitchen. It's rare to find anyone making it by hand these days, so many pre-made prik pao are found in stores. 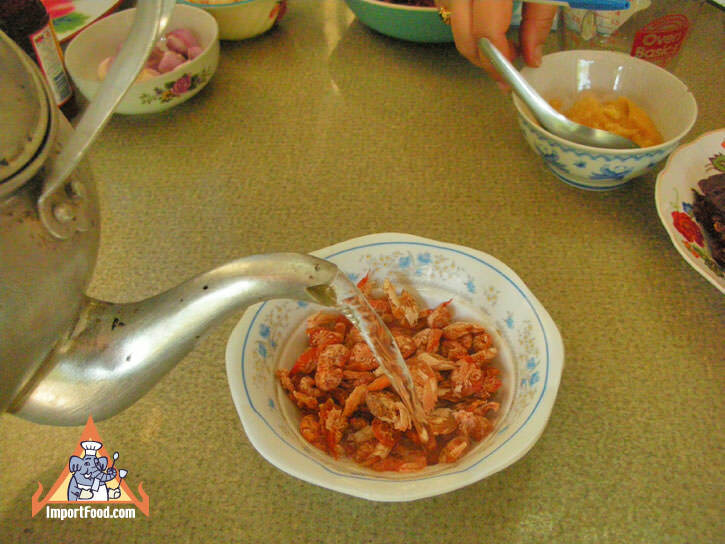 Pour hot water into the dried shrimps to help it to get soft. In dry wok with low heat, roast garlic. Keep stirring until turn golden and fragrant. Remove from heat and set aside. 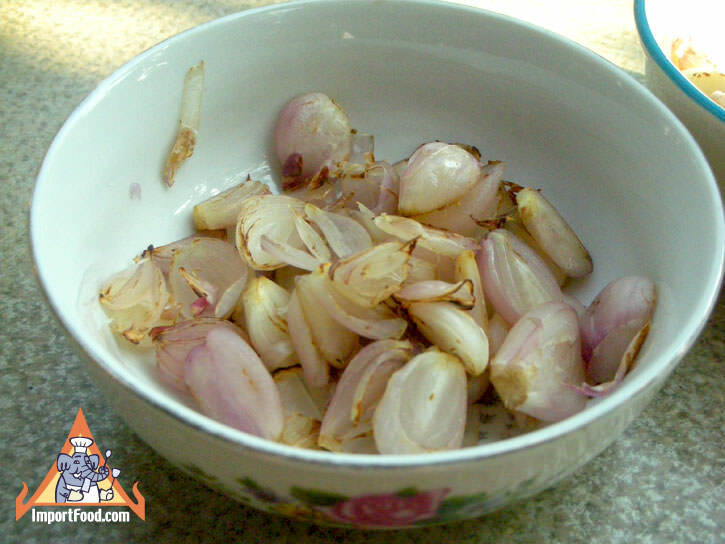 Roast shallot in wok until golden and fragrant, remove from heat and set aside. 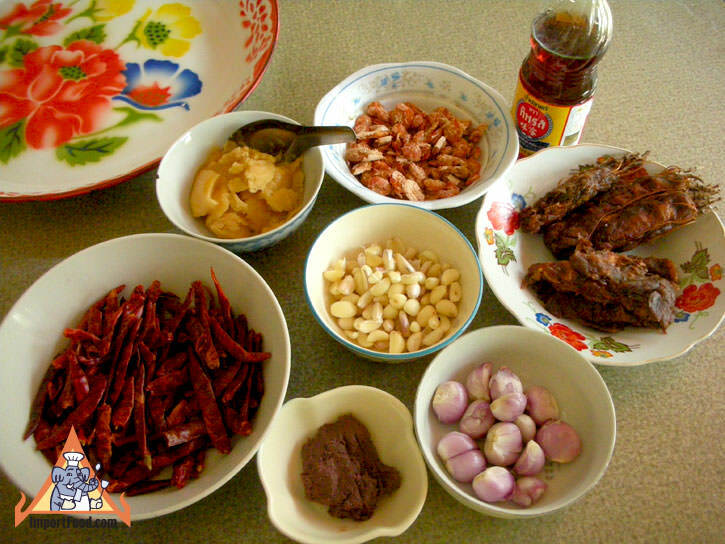 Roast shrimp paste until fragrant, remove from heat and set aside. 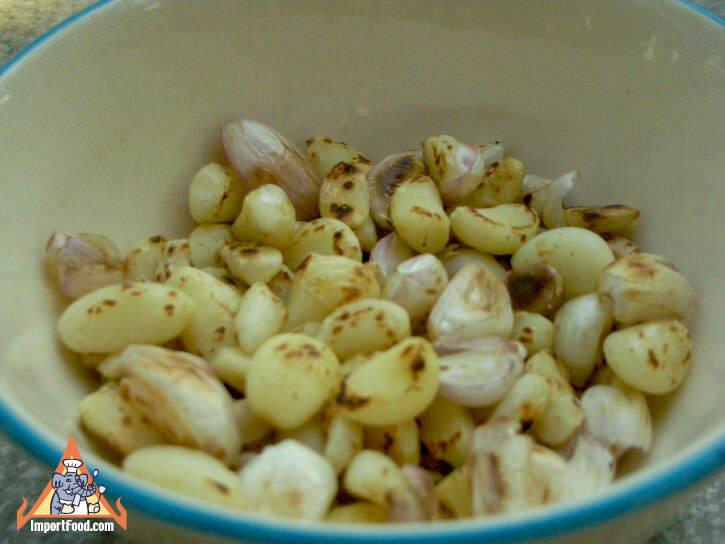 Roast dried chills in wok until golden and fragrant, remove from heat and set aside. 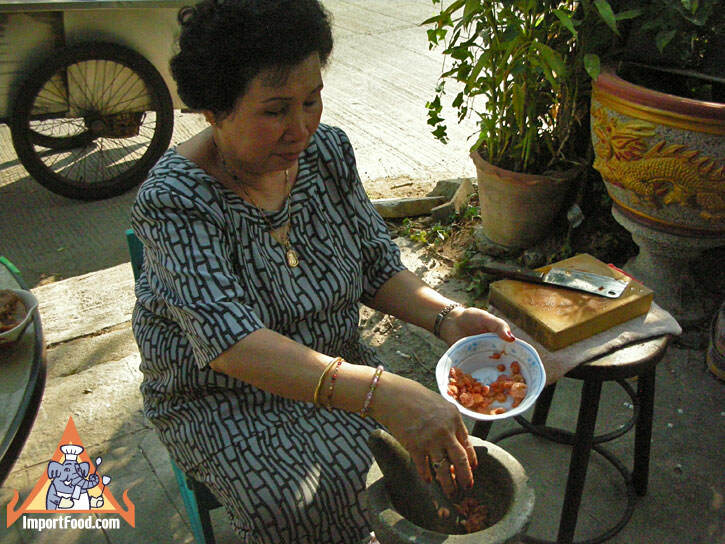 Put tamarind into a small bowl, add water just until covered, then squeeze with your hand a couple times. Transfer paste to cutting board then chop for easy pounding, set aside. Drain and rinse dried shrimps then add to mortar and pestle. Pound until fine, remove and set aside. 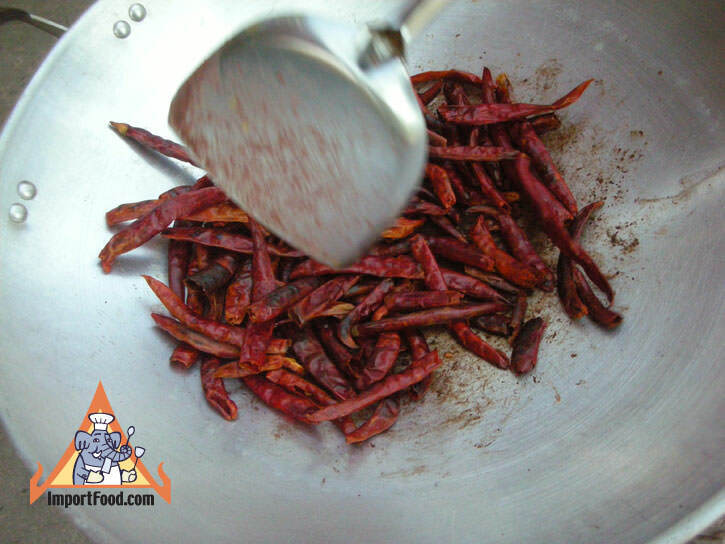 Put roasted chilis into the mortar, pound until fine Add dried shrimp to the mortar, followed by garlic, shallot, shrimp paste and tamarind paste. Season with palm sugar, fish sauce and salt, pound until well blended. 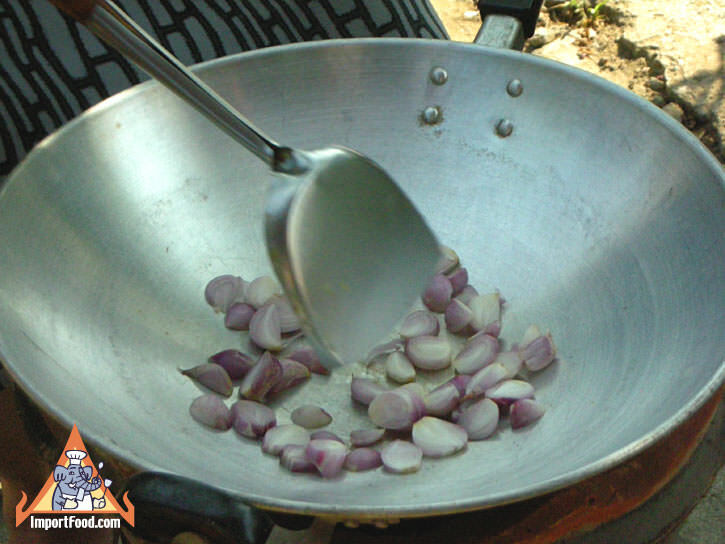 In a wok with medium heat, add oil . Add chile mixture into heated oil and stir fry until fragrant. Remove from heat. Enjoy! 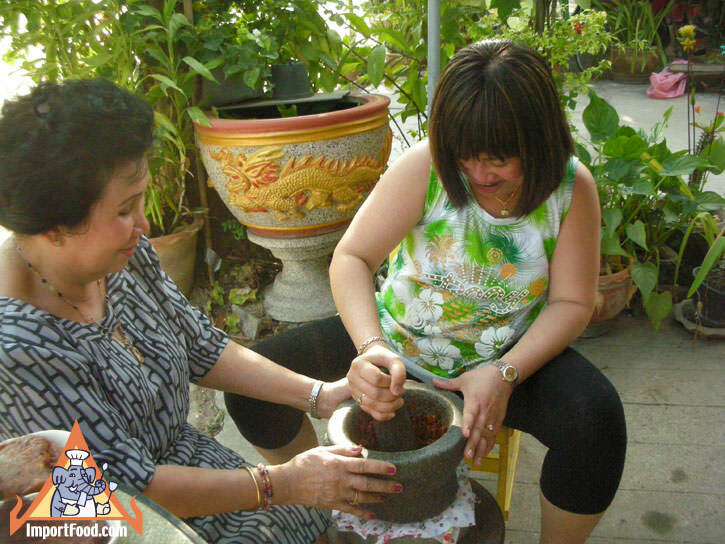 Mae Pranom brand has been around for decades, one of the first food companies offering convenient ready-made chile paste and sauces. They maintain a small product line of traditional products, focusing on the highest quality. We're honored to offer Mae Pranom, especially their sweet chile sauce for chicken which is our favorite. 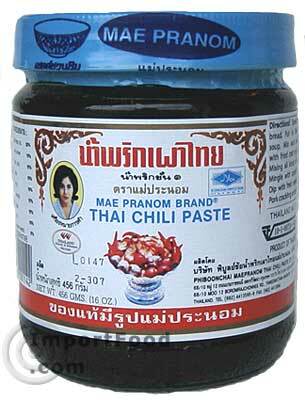 If you don't want to prepare handmade Prik Pao, consider this premade version, here called "Thai Chile Paste". Loaded with salty, oily, spicy hot, mildly sour flavor. 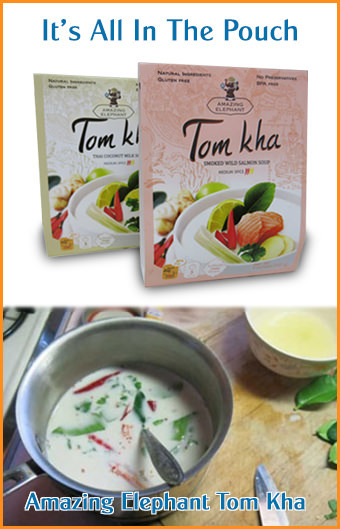 A key ingredient in tom yum but also delicious in various seafood recipes such as hoy lai ped. Ingredients: 20% vegetable oil, 15% dried shrimp, 10% dried chile, 10% onion, 10% garlic, 10% tamarind, 10% sugar, 10% salt, 5% shrimp paste. Packed in a beautiful glass jar with attractive label. Product of Thailand.